Of all the battles a SEAL (Sea, Air, Land) must fight, none is more important than their first– the battle of mind over body. Trainees are constantly in motion; constantly cold, hungry and wet. Mud is everywhere–it covers uniforms, hands, and faces. Sand burns eyes and chafes raw skin. Medical personnel standby for emergencies and then monitor the exhausted trainees. Sleep is fleeting–a mere three to four hours granted near the conclusion of the week. The trainees consume up to 7,000 calories a day and still lose weight. The inner voice mimics the BUD/S instructor pacing the line of waterlogged men with his bullhorn. “If you quit now you could go get a room at one of those luxury hotels down the beach and do nothing but sleep for an entire day! Throughout Hell Week, BUD/S instructors continually remind candidates that they can “Drop-On-Request” (DOR) any time they feel they can’t go on by simply ringing a shiny brass bell that hangs prominently within the camp for all to see. It is not the physical trials of Hell Week that are difficult so much as its duration: a continual 132 hours of physical labor. Through the long days and nights of Hell Week, candidates learn to rely on one another to keep awake and stay motivated. They tap one another on the shoulder or thigh periodically and wait for a reassuring pat in response that says, “I’m still hangin’ in there, how ‘bout you?” They cheer loudly when they notice a mate struggling to complete his mission and use the same as fuel when they themselves feel drained. They learn to silence that inner voice urging them to give in and ring that hideous, beautiful bell. Sleep. He would do anything for it. He couldn’t remember what day it was, or when he had last slept. But, he knew it felt good, and NOTHING about “Hell Week” felt good. He had been cold and wet for days. There were open sores along his inner thigh now from being constantly soaked. And every time he moved, the coarse, wet camouflage raked over the wounds, sending lightning bolts of pain through his body. Maybe the voice was right. Maybe he should just get up, walk over, and ring that bell. Only those individuals who have clearly demonstrated sustained superior performance, outstanding leadership abilities, and the potential to serve as commissioned officers should be recommended for these programs. A candidate must receive a favorable endorsement from the commanding officer (unit CO for SELRES personnel) to be eligible to apply to become an LDO. If a commanding officer feels an individual is not qualified for LDO, the commander will not forward the package. Individuals not receiving a favorable endorsement are to be counseled on what they need to do to improve their records to ultimately receive a favorable endorsement. Separate selection boards (one for active duty and one for inactive duty) meet at the Navy Personnel Command annually to consider applicants for the active duty and inactive duty LDO programs. CWOs selected for LDO will be appointed in the permanent grade of LTJG (paygrade O-2) in the Navy (or Naval Reserves for inactive duty personnel). CWOs selected for LDO with at least 4 years and 1 day of cumulative active duty service to include (ADSW/AT) will be appointed in the permanent grade of LTJG (paygrade O-2E). Enlisted personnel selected for LDO will be appointed in the permanent grade of ensign (paygrade O-1) in the Navy (or Naval Reserves for inactive duty personnel). Enlisted personnel selected for LDO with more than 4 years of active duty service will be appointed in the permanent grade of ensign (paygrade O-1E). Selectees will be appointed as LDOs only if they continue to meet all eligibility standards as specified previously. Active Duty selectees must agree to remain on active duty for 4 years from the date of acceptance of appointment and may be required to transfer from current duty location. Selectees under the inactive duty program must continue serving in the Ready Reserve until the appointment is tendered. Upon acceptance, each selectee must agree to remain in the Ready Reserve for a period of 3 years from the date of acceptance of appointment. Candidates must break through ice-encrusted waters, jump in without the protection of their dry-suit, tread water for three to four minutes, pull themselves out of the water, then dry their clothes and gear off. While some might question the necessity of being inducted into this “Polar Bear Club,” SEAL candidates once again silence inner doubts and follow instructions as given. Even in the later phases of SQT, candidates call upon their mental determination to pull them through. 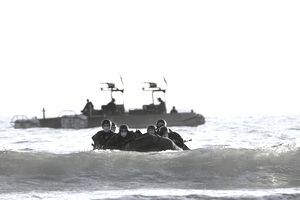 After the completion of Cold-weather Survival Training, they are awarded their trident badge and Navy Enlisted Classification code at Naval Special Warfare Center, Coronado, Calif.
With terrorist threats on the rise around the world, SEALs are needed more than ever. Yet, even with a pressing need for more such men, training of candidates remains as tough as it has ever been. The 24-month training process will continue to separate the determined candidates from the undecided. As Navy SEALs put their lives on the line defending America, each member of that team must know without a doubt that the man fighting next to him will not give in or punk out when things start to get rough.